Why all the hubbub about a citizenship question in the 2020 Census? The truth is the government already has all the information it needs. Every ten years comes the official Census. But that doesn’t mean government workers for the next decade pass the time by twiddling an abacus. 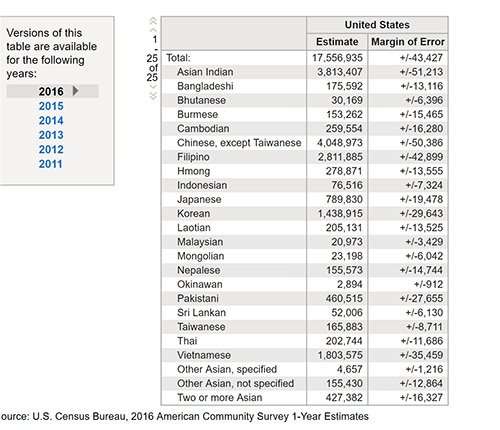 Each year there’s a release of what’s called the American Community Survey, or ACS, which is quite detailed and tells us things like how many different kinds of Asians there are. 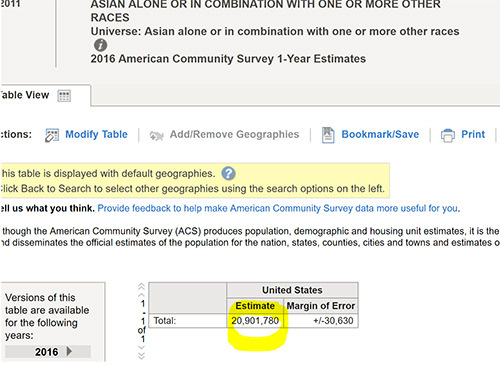 The really valuable numbers to compare and contrast are the overall Asian alone numbers (17,556,935) versus the Asians “in combination” number, which heralds the HAPA, at 20,901,780. Another question the ACS asked was how Asians transported themselves to work. Out of 8.6 million who answered, 5.7 million people said they drive alone, versus 938,340 who used public transit. Another 337,260 said they walked. These are among the array of numbers taken by inquiring Census folks in the ACS. And since 2005, the question of citizenship has been asked. So how many citizens are there in the U.S.? Every year it’s asked in the ACS and the latest numbers are, of 323,127,515 Americans, 274,384,971 are born-here U.S. citizens. Add those born in Puerto Rico or U.S. Island areas, and those born abroad to American parents, and the total grows to 279,388,170. Add to that pot of citizens another group, those who passed the test, took their oath, and naturalized (21,238,372), and the total comes to 300,626,542 citizens. How many are “not a citizen”? ACS, which updates this yearly, says 22,500,973. About 7.5 percent are not citizens. What more do you need to know? We already should know that we don’t need a multi-billion dollar wall, nor do we need to spend millions to make census-taking into junior ICE agents. And that’s the insidious nature of the proposal by Commerce Secretary Wilbur Ross, no doubt done to ingratiate himself with Donald Trump. You have an update on the citizenship question every year in the long-form ACS. (I filled it out one year and couldn’t believe how complicated it was.) But to add the citizenship question to the ten-year short form serves no purpose, except to harass and drive away more people of color from participating at all in the national count for fear of deportation. Given that Trump and his base are trying to make sure that America puts off being a minority-majority country for as long as it can, an undercount is very desirable. In minority heavy states like California, Texas, Florida, and New York, an undercount would tend to cut federal dollars, gut Democratic support, and realign congressional districts. It’s a Trumpian trifecta, with the cherry on top—the preservation of a white majority and the delay of the inevitable state of America where the minorities are the majority. Trump has already attacked states like California, which adopted sanctuary policies to counter vigorous ICE enforcement. He’s flip-flopped on DACA to keep 800,000 dreamers and their families at the highest anxiety level. Just look at Trump’s venom this weekend with a scathing tweet critical of Governor Jerry Brown for issuing 56 pardons and commutations, including five to immigrants who faced deportation including three Asian Americans: Sokha Chhan, Daniel Maher, and Phann Pheach. I wrote about Maher’s case here. With Trump’s obvious disdain toward immigrants, what could be better than enlisting the Census to createmore fear and harassment in communities? Ross/Trump are at a xenophobic high point. Find the foreigners. Root them out. And send a chill throughout America. Asian American studies folks know all about this sort of thing. Dan Gonzales, Professor of Asian American Studies at San Francisco State University’s College of Ethnic Studies, was at the AAAS meeting in San Francisco, and he had an idea for a compromise if Ross/Trump insisted on the citizenship question. “Anonymize the census return,” Gonzales told me, offering what he thought could be a plausible, though unlikely, compromise. He’s still suspicious of the proposal given the administration’s dealings on DACA. Can you trust Ross/Trump on the Census citizenship question after DACA? Gonzales isn’t surprised not as many signed up after ICE did outreach to Asian American communities. He points out that the Asian visa overstays don’t have the same problems as Latino DACA recipients. The government doesn’t have their records. But Gonzales still fears an undercount of Asians and says the only way out of the citizenship question may be an overhaul of Congress in the midterms. Gonzales is a unique member of the AAAS attending this year’s meeting in San Francisco. 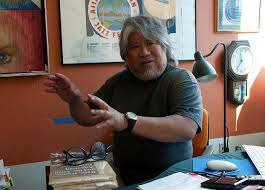 He’s one of the few who was there for the SF State strike 50 years ago that spawned the move toward ethnic studies. It was a watered down demand compared to the call for Third World liberation studies. But unlike other schools, all the different groups–Asians, Latinos, and Blacks–were united into an integrated school. Gonzales explained that was intentional to build something that could withstand institutional threats and challenges. It’s the difference between how SFSU and other AAS programs around the country. Coincidentally, one of Gonzales’s former graduate students, Prof. Theo Gonzalves, who recently moved from University of Maryland Baltimore County to the Smithsonian, is taking over as president of AAAS. Hear Gonzales talk about: the SF State Strike; how its College of Ethnic Studies was born out of the strike; how the school continues to thrive compared to elite schools with small AAS programs; all that and the future of the AAS in an upcoming edition of Emil Amok’s Takeout.